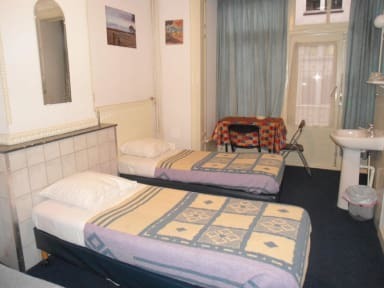 The Bed & Breakfast Groenendael is absolutely perfect for any type of traveler, whether you are a small family or just a backpacker with or without company. The building itself has a lovely Authentic feeling to it, as it is a narrow but high building with beautiful stairs and a nice view of the shopping street and many people that walk through it every day. 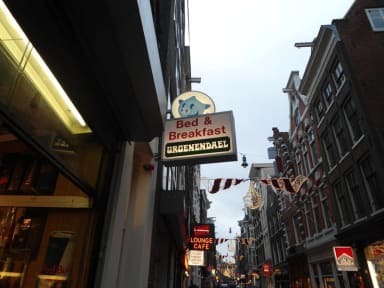 We are located in the most popular street of Amsterdam, the Nieuwendijk, a long shopping street which goes on to the Dam square and meanders on to the nightlife areas Rembrandt square and Leidse square. It is a 5 minutes walk from central station which has all access to public transport and quick connection to Schiphol airport. Here you can enjoy comfortable rooms designed to accommodate the requirements of any traveler. We offer private rooms (twin, double or triple) with shared bathrooms and showers on every floor. We also have a couple of rooms with shower inside at request. The rooms might be ready at 12.00 AM since they have to be cleaned first. Bagage can be left in the lounge.